Mission Bay Aquatic Center Blog: This month's Watersports Camp Clinic is fun for the whole family! 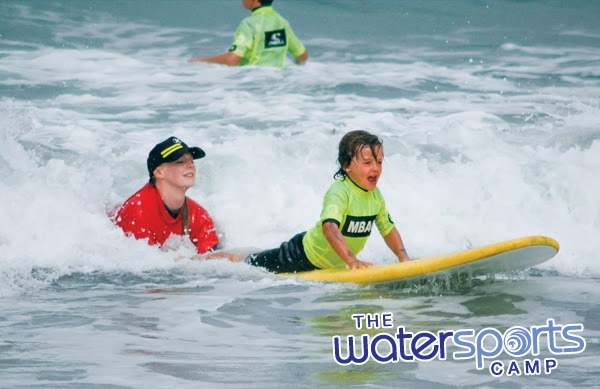 This month's Watersports Camp Clinic is fun for the whole family! The second event in our year-round series of Watersports Camp Clinics is coming up February 23rd and if you've ever wished you could attend camp alongside your child then you won't want to miss it! The Youth and Family Intro to Surfing Clinic is an opportunity for campers, parents and families to enjoy a morning of one of most popular camp activities. On Sunday, February 23rd, from 9:00am-12:00pm you and your camper can join your favorite surf instructors for a half-day surf session that will be a fun and unique family experience. We'll start with some basic instruction, wetsuit up, and head out for some family fun in the waves! The cost of the activity is $50/person and spaces are limited, so sign up today! If you’ve ever wanted to try surfing there’s never been a better opportunity than to learn with your loved ones by your side to laugh, smile, and yell in excitement when you catch your first wave. This event is designed for beginner and intermediate surfers, providing an opportunity for you to learn in a welcoming environment with our qualified (and very patient) surf instructors. We want to create a place to get the whole family involved and enjoy the sports we love! Keep your eyes open for more youth and family events coming each month, like a moonlight kayak, and family sailing day, as we lead into summer! We can’t wait to see you on the water!